I recently installed a new STYLO crank on my SS but wanted to swap out the 32T original ring for a SURLY 33T. I bought a set of PROBLEM SOLVER alloy chain ring bolts, as they had a slightly shorter nut. I checked as I assembled the crank and ring to be sure the nut was long enough to protrude beyond the crank "spider" without being long enough to duplicate the problem I was trying to fix. I would estimate the nut protruded about HALF way through the the rings thickness. 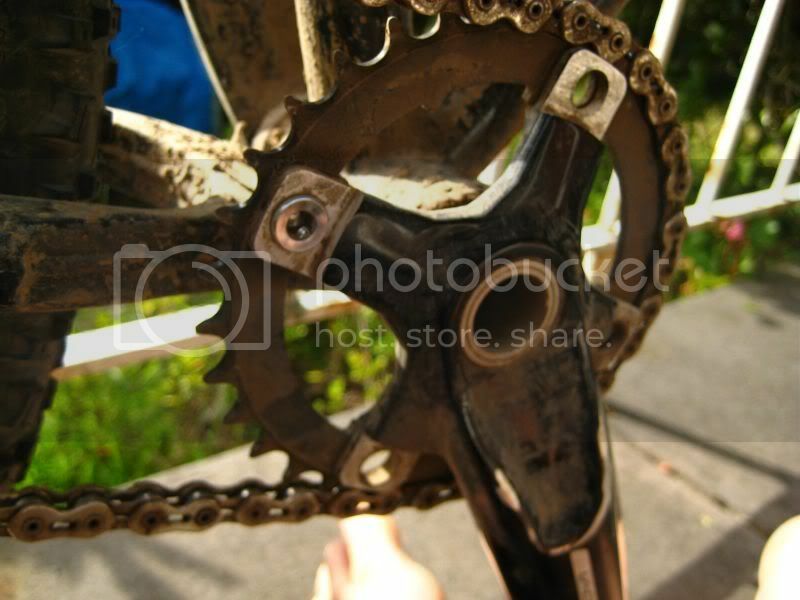 After about 5 or 6 hours of hilly single-track I was checking chain tenion when I noted that the "arm" of the crank spider and the "arm" of the ring were no longer aligned. Removing the bolts I found that roughly a third of the nuts circumference that was protruding into the ring had been sheared off and the ring was now resting on the threads of the bolts.. I filed the original steel bolts to fit EXACTLY and it has been fine. I'm not faulting PROBLEM SOLVERS or alloy hardware. I am just saying that simply using SINGLE SPEED CHAIN RING BOLTS may or may not get the job done and I should have paid closer attention to being sure I had a PERFECT fit. I shudder to imagine being 3/4 of the way up a monster climb and having the chain ring and crank go their separate ways. If that were to happened to me I would be finding blame somewhere. You came close to having a catastrophic failure, eh? For the nuts to shear off they would need to have movement between the ring and spider. Sounds like you need to invest in a torque wrench. If you have the chain guard, you need the double chain ring bolts. Without the guard, single chain ring bolts. FWIW, they were correct sized stainless chainring bolts which came loose without much warning (no locktite used). Okay, so what do you think the problem was? It sounds like your setup with the alloy nuts was also dead on, yet it failed. The usual suspect is the nuts were not tight enough, but that wasn't part of your conversation. A couple of other possible causes came to mind, but I have to see your setup first. get the SRAM steel single ring bolts. They're the easiest to tighten and stay tight due to the double hex head, instead of that wonky split-spanner inside head.